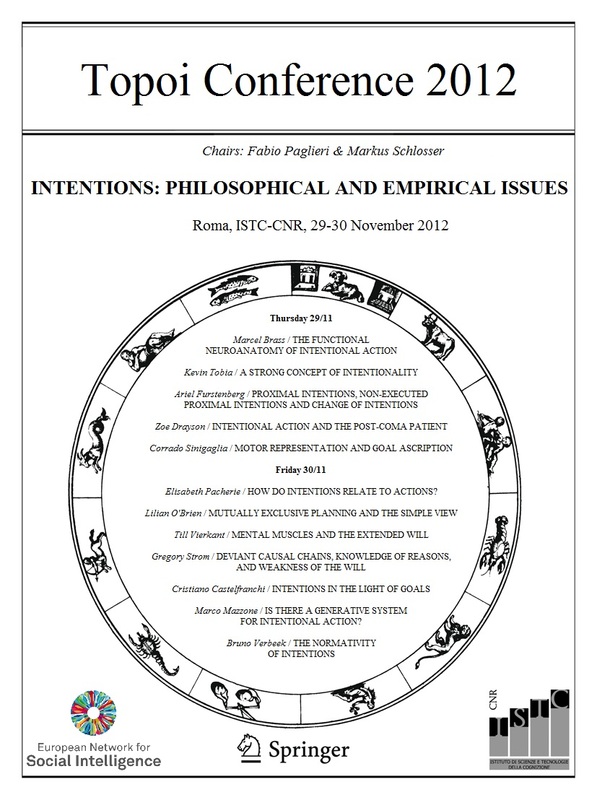 This is the first edition of the TOPOI CONFERENCE, a series of biannual conferences in philosophy, sponsored by Topoi: An International Journal of Philosophy (http://www.springer.com/philosophy/journal/11245). In analogy with the journal format, each conference will focus on a specific theme (topos), and contributions presented to the conference will later appear in an issue of the journal dedicated to the same topic. The conference booklet is available for download, including the programme, all abstracts, and practical information on the conference (please make sure to get the latest and most updated version, by checking this website just few days before the conference). 16:00-16:45 Marco Mazzone (Catania), IS THERE A GENERATIVE SYSTEM FOR INTENTIONAL ACTION? The conference will be held at the Institute of Cognitive Sciences and Technologies of the National Research Council of Italy (ISTC-CNR, http://www.istc.cnr.it/), Via San Martino della Battaglia 44, Rome, Italy. The language of the conference is English. Attendance is free and no registration is required. All meals will be provided for the authors of accepted papers, but no reimbursement for accommodation and travel costs is available. The conference is organized by Fabio Paglieri (Rome) and Markus Schlosser (Groningen), and sponsored by Topoi, Springer, the European Network for Social Intelligence, SINTELNET (http://www.sintelnet.eu/), and the Goal-Oriented Agents Lab (GOAL, http://www.istc.cnr.it/group/goal) of the ISTC-CNR.